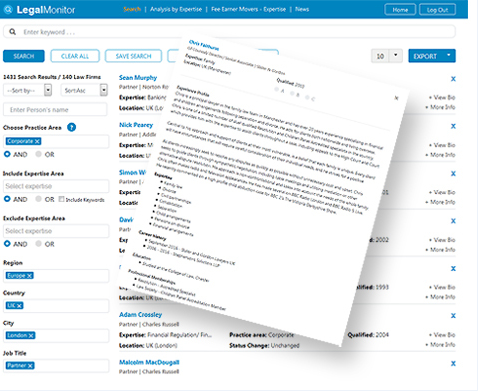 Legal Monitor is a dedicated law firm search engine. It combines the latest in search and analytics technologies, and is the perfect solution for sourcing the best legal candidates, identifying hiring trends and conducting law firm market mapping research. Our platform can also be used to aggregate information on firms and practice areas and offers the user a granular insight into legal markets across different jurisdictions . In combination with our Legal Moves tool it provide a 360 degree view of any practice area, law firm or geographic region.